Kim’s Chinese pancakes have deservedly become a well-known brand name in both the Chinese and English food markets. 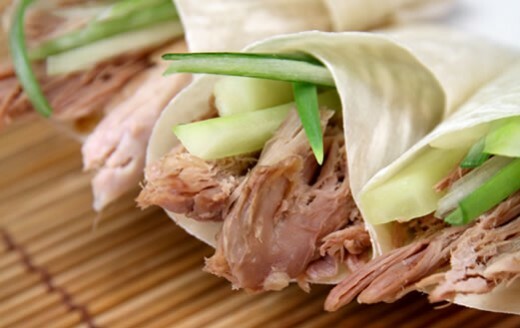 Our exceptional Chinese pancakes are versatile and can be used to wrap crispy duck, crispy lamb, crispy chicken as well as a wide range of vegetables and seafoods. Our Chinese pancakes are attractive, perfectly round and consistent in quality, shape, size, thickness and texture. They are produced to allow full enjoyment of the tasty contents and can be used as the basis for a variety of dishes and for different cuisines. Kim’s Chinese pancakes will not stick together after being heated by steam or by microwave, making them very easy to use and avoid wastage. In addition, they are robust, remaining intact to hold dry or moist food contents in place – perfect for wrapping finger food at parties and barbecues. Our standard pack sizes include 6 and 10 Chinese pancakes but we can cater for alternative pack sizes on request.